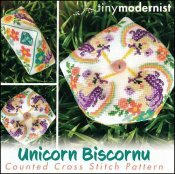 Unicorn Biscornu [W5701] - $6.00 : Yarn Tree, Your wholesale source for cross stitch supplies. Cross stitch pattern from Tiny Modernist. Filled with magic, this biscornu features unicorns with beautiful long purple manes & rosy red cheeks! A rainbow & flowers are stitched by each unicorn. Sparkle like a unicorn! Stitch count is 71H x 71W.